Mark B comes through with yet another superb safari story about Nyala hunting in South Africa! My Safari produced a Hippopotamus, two Cape Buffalo and a Giraffe thus far. The next animal on my list was a Bushbuck. We drove around looking for tracks of a Bushbuck. Each time we found fresh tracks we jumped out of the truck and went into the woods with the tracker, PH and me following. It is summer and daytime temps get into the 90’s so it was plenty warm and humid. Each time a stalk was started the Bushbuck eluded us. The day ended with the Bushbuck winning. The next day we started out early again and it had rained that night so all the tracks we saw would be fresh and worthy of a stalk. The first stalk was around 45 minutes but it only produced a female. We made many more stalks that day but the Bushbuck always outsmarted us. I sweat so much during the hunt that my clothes looked like I had been swimming in them. My PH, Clint Mattheus of Clint Hunting Safaris, talked with PH Hannes Nel of Boschnel Safaris whose farm we were hunting suggested a substitute animal since we worked so hard yet failed to produce a Bushbuck. I was asked if I would be interested in a Nyala. After talking with Clint about it, I said “Absolutely”. We would need to travel to a different farm that was actually closer to Johannesburg which was my departure flight location. We headed out for the new farm to settle in for the evening. I had one day left on My Safari. We headed out in the morning to locate some Nyala. This time Clint, Etienne Van Zyl and Brendan Nel on camera were present. We searched and walked and searched and walked but could not find any fresh tracks. It was decided that we should try a different area. As we arrived in the new area, we immediately spotted Nyala tracks. A stalk was started but they knew we were in the area. We went here and they went there and back and forth. Finally, Etienne split off from us to see if he could turn the Nyala towards us. It wasn’t long before a Nyala female was located. At this point things started to look much more promising. Clint could see some movement and set up the sticks towards an open area in the forest. I placed my .375 on the sticks and waited. There was a particular bull I was supposed to take. There were two bulls in the group. Clint would tell me which one to take. I waited on the sticks and I could see movement from the right of the forest opening. The first to come by was a small group of female Nyala. Immediately behind the females was the bull I was supposed to shoot. I readied my rifle and Clint said, “That’s him”. I pressed the trigger and my rifle did not fire. Damn… I had forgotten to take off my safety. I was really pissed as everyone worked so hard to get me to this point. All of a sudden Clint said, “They’re coming back … here he comes”. The distance was about 60 yards. As luck would have it The Nyala Bull must have been dying to give me another chance. I remained on the sticks but this time My safety was off. The first Nyala Bull to appear was not the one I was to take yet not far behind him was the bull I was to shoot. I told myself he was not getting by me this time. After 40 years of deer hunting in Georgia, USA I wasted no time shooting. As soon as I could see the front of the shoulder I squeezed the trigger and the recoil of My rifle sent me backwards. The Nyala went off in a blur and I wondered if the shot had been true. Soon we could see the other Nyala leaving the opposite side of the thicket where they had last been seen. My bull was not with them. After waiting for a short while we slowly approached the area we thought the bull would be. Clint spotted the downed bull and after checking for signs of life he came and shook my hand. Wow what a great and beautiful animal this Nyala was. I could not have done this without the help of Etienne pushing the Nyala towards us. I still had half a day left for my hunt and in the afternoon we left in search for a nice warthog. We walked down to the bottom, searched and waited. None showed. All I had to do now was walk back up the very agonizing long steep hill back to the truck. This was the end of my Safari as my plane will be leaving the next day. I met with a local taxidermist, Jaco Nel of Mafuta’s Taxidermy, about my mounts. I had some South African Amarula and a cigar and called it a night. I had wonderful time on this Safari and took some great animals. Thank you JD Safaris, Clint Mattheus of Clint Hunting Safaris, Etienne Van Zyl, Hannes & Brendan Nel of Boschnel Safaris for the hunt, videos and hospitality and the tracker for another great hunting experience. 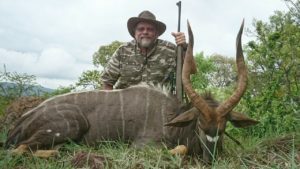 Does Hunting Nyala in South Africa intrigue you? Call JD African Safaris to discuss your hunting safari! Or, complete our form for more information or a quote!